Â© Costa Rica Tourism Board. All Rights Reserved. SPOTLIGHT 10	Micky Arison Recounts History in the Industry “from the Ground up” and Forecasts a Future of Success The chairman of Carnival Corporation & FCCA takes the time portal to 1972, tracking the industry’s evolution—along with how guests & destinations/stakeholders drive adaptations—while looking ahead to continued growth through an innovative & global approach. The information in this publication is provided “as is.” FCCA, CLIA and its Member Lines disclaim all representations and warranties, expressed or implied, with respect to any information, services, products and materials contained herein. FCCA, CLIA and its Member Lines will in no event be liable for any damage or losses as a result of your use of this publication. MEETINGS & EVENTS 24	Business and Relationship Development Hits High Gear on the High Seas FCCA Platinum Members embarked on a weeklong journey packed with meetings & networking with nearly 30 highlevel cruise executives. YOUR PASSENGERS’ U.S. VIRGIN ISLANDS STORY STARTS HERE Shopping, beautiful beaches, awe-inspiring attractions and exciting activities await those arriving at one of our USVI ports. Our ports are designed to keep passengers and crew happy and to meet the needs of our partner lines. For more information on the ports of the U.S. Virgin Islands, visit www.viport.com and www.wico-vi.com. T&C: To start, talk about the advantages of collaboration over competition in certain areas. 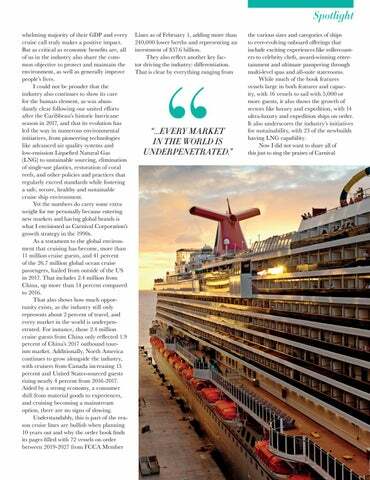 AG: Cruise lines compete with one another in the marketplace for customers and advantage. That’s the reality. However, there are areas where we are allowed to cooperate, by which I mean primarily safety, the environment, security, medical and public health. Caribbean, where many countries are islands with relatively small populations heavily reliant on tourism, where service excellence training, insurance programs for tour operators and so on are critical. 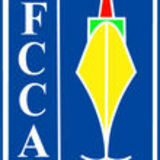 Yet FCCA also covers Mexico, which has multiple levels of government and farflung destinations, and recently added most of Latin America, where there are larger populations, economies and needs for operational information. CLIA and FCCA, each in their own way, bring together cruise line members and third parties with significant interests in the cruise sector and work for the common benefit of all stakeholders. T&C: Has there been an instance that crystallized collaboration by the industry’s players not only for their mutual benefit but also, as you say, for the benefit of the destinations? AG: By far the most significant events during my tenure as FCCA chairman were Hurricanes Irma and Maria in the fall of 2017. The simultaneous impacts on several principal Caribbean cruise destinations was unprecedented in my 30 years. This posed a tremendous challenge to, first of all, the people who live in those destinations and their governments, and second, to industries like ours with whom the destinations have close relationships. While under duress themselves, our cruise line members had to figure out how we could work together for the immediate response and then, longer term, in the recovery effort. A new partner on board brings more choices on shore. Two paths coming together with a steady goal can broaden horizons for all. 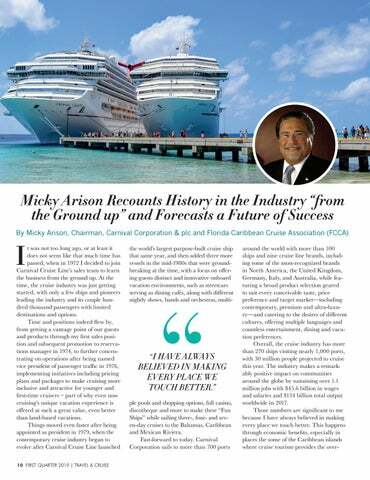 Through a shared vision and passion for the cruise industry, Florida-Caribbean Cruise Association (FCCA) and ExcursionInsurance.com have joined paths. As the new administrator of the FCCA Global Tour Operator Insurance Program, ExcursionInsurance.com provides tour operators with the coverage they need to grow their businessâ&#x20AC;&#x201D;and enhance the destination experience. Soon after Seaside rang its horns and announced its departure for San Juan, members and executives embarked on those chances for positive developments at the first scheduled event, a business card exchange reception, where they swapped not only cards and salutations, but also trends and developments—from a new destination product or target market, to a new child or hobby. CRUISE THE BVI FROM COAST TO COVE. Uncover the true spirit of the BVI while enjoying the best-kept secret in the Caribbean. Disembark at Tortola Pier Park, where unique local craft shops and authentic restaurants neighbor international brands and lively entertainment. Spend your day on land, where endless possibility is just a beach away, or out at sea with the wind in your sails. On Board of Carnival providing exciting new ways for our guests to ‘Choose Fun.’ We are so thrilled to introduce this one-of-a-kind, game-changing, exhilarating attraction – our guests are going to love it!” Mardi Gras will be based in Port Canaveral, which will feature a new state-of-the-art terminal. A second XL-class ship will start construction in 2020 and be delivered in 2022 to mark the 50 th anniversary of Carnival Cruise Line’s founding. MSC Grandiosa, One of 15 NextGeneration MSC Cruise Ships Due by 2027, Floats Out On January 5, MSC Cruises celebrated the float out of MSC Grandiosa. Scheduled for delivery this October, she will be the third Meraviglia ship; the first of three Meraviglia-Plus ships, featuring larger tonnage and guest capacity, with Grandiosa at 181,000 GT and total passenger capacity of 6,334; the fifth ship to enter MSC Cruises’ fleet in just two and a half years; and one of 15 next-generation cruise ships currently due for delivery by 2027 through MSC Cruises’ fleet expansion plan. MSC Grandiosa will showcase an even larger Mediterranean-style promenade, the groundbreaking feature unique to Meraviglia-generation ships that serves as the social hub of the ship. Amongst other specialty restaurants it will feature a new bar and lounge, L’Atelier Bistrot, offering lounge seating with a stage and a dance floor, impressionist art on display and terrace seating with Parisian Bistrot tables and chairs. This award-winning promenade will host surprise performances, including flash mobs and themed parties as well as the awe-inspiring projections on the even longer 98.5-metre LED Sky screen. stress-free way to receive information that is traditionally provided at the Guest Relations desk. MSC Grandiosa will be delivered to MSC Cruises on October 31 and will start regular sailings from Genoa, Italy on November 16.
addition in late 2023, when delivery is scheduled for the new 750-guest ship representing the third in the Explorer class and Regent’s sixth all-suite vessel. “We are excited to build on the spectacular success of Seven Seas Explorer and Seven Seas Splendor as we embark on bringing to life a new vessel that will set an even higher benchmark for elegance, luxury and style,” said Frank Del Rio, president and CEO of Norwegian Cruise Line Holdings Ltd. “This new ship further strengthens our company’s robust yet measured growth profile with vessels now on order for all three of our award-winning brands, enabling us to expand our presence globally, further diversify our product offerings and continue to drive shareholder returns.” Fincantieri is currently building Seven Seas Splendor at its Ancona, Italy shipyard, with relentless focus on perfecting every detail during construction so the ship’s inspired design truly dazzles guests as a work of art. culinary experience, as well. The brand seized the “revolutionary” opportunity and reimagined many of the restaurants and lounges. Guests will find even more luxurious enhancements across the ship as part of THE CELEBRITY REVOLUTION, including advanced pervasive Xcelerate Wi-Fi; new boutiques featuring some of the hottest designers in the world, including Shinola, John Hardy and Hublot; a new, wellness-focused Spa design by renowned New York design firm Krause Sawyer; a new, semi-private consultation area in the fitness center for personal training and consultations; a new salon; a newly enhanced Persian Garden thermal suite; and a sleek and sophisticated redesigned Casino and Casino Bar. Guests are not the only ones who will get to experience THE CELEBRITY REVOLUTION, as “revolutionary” enhancements were made across the crew areas, including accommodations. Celebrity Millennium is just the first revolutionary revitalization for the brand. Celebrity Summit has already entered dry-dock in the Bahamas for its own stunning transformation, with seven more ships to be modernized by 2023. On Board TUI Cruises Delivers Mein Schiff 2 Germany-based cruise operator TUI Cruises delivered its new and improved Mein Schiff 2 on January 22. The company’s sixth newbuild in six years features environmentally conscious technologies and interiors, including a hybrid scrubber that washes out the ship’s exhausts; comprehensive energy management system; a hydrodynamic hull shape; a more efficient air conditioning system; optimized onboard space; fabrics made from GOTScertified organic cotton; and wooden furnishings in the cabins all responsibly sourced from forestry schemes, certified with the FSC Mix label. Significant Milestone in Carnival Panorama’s Construction Commemorated with Traditional Maritime Coin Ceremony With its California debut less than a year away, Carnival Panorama’s exterior completion was celebrated at the Fincantieri shipyard in Marghera, Italy on December 17, during which a commemorative coin was welded to the ship’s mast in a time-honored maritime tradition. And just like the ship will take its guests on memorable journeys, the coin itself took a memorable journey throughout the state of California before winding up at the Fincantieri shipyard. cruise line’s enriched World Cruise 2019. During the ship’s dry dock period, which lasted from December 1-19, Silver Whisper underwent a large-scale renovation, completed in line with the Musification strategy that is inspiring the enhancement of Silversea’s fleet. The initial refurbishment plans of Silver Whisper were revised and augmented following the launch of Project Invictus, Silversea Cruise’s long-term plan to enrich and enlarge its fleet. With the comfort of guests in mind—namely, world cruising guests on the Tale of Tales—all public areas and guest accommodation were enhanced. In public spaces, new carpets were laid throughout the hallways, staircases, in the main restaurant, the main bar, and all guest suites. The Main restaurant underwent a complete refurbishment, with new curtains, new chairs and new wallpaper, among other enhancements; the Spa & Gym was upgraded with new equipment and other improvements, and the Beauty Salon was also completely upgraded; the Card & Conference room was entirely renovated; La Terrazza, the Panorama Lounge, the Central Staircase and the Casino were each also enhanced dramatically. The Pool Deck benefited from a new teak design, as well as an overhaul of the Pool Bar & Grill and other enhancements. New sun loungers and new balcony furniture completed the refurbishment of outdoor areas. The comfort of guest accommodation was also upgraded: in Silver Whisper’s top suites, new carpet, reupholstered and new furniture, new wallpaper, and revamped wooden surfaces saw the Musification of accommodations. All suites were invigorated with improvements to the en-suite bathrooms; new mattresses, curtains and furniture; and wood polishing. Aboard Silver Whisper and Silversea’s other ships, guests enjoy ocean-view suites, sumptuous cuisine, and the personalized service of a butler. Enriching the experience are such all-inclusive amenities as complimentary premium wines and spirits, specialty coffees, bottled water, juices and soft drinks served throughout the ship; an in-suite bar, stocked with guests’ preferences; in-suite 24-hour dining; and unlimited complimentary Wi-Fi. Ice-Classed and Enhanced: Silversea Announces Plans for Additional Refurbishment of Silver Wind Following the completion of a major refurbishment project of Silver Wind started in December 2018, Silversea Cruises announced plans for a second. Scheduled for summer 2020, the second dry dock period will give the ship ice-class classification and improved cruising versatility, as well as a number of improvements to the vessel’s interior. As a result, Silver Wind will unlock a broader range of deep travel experiences for guests in ultimate comfort, cruising both classic and expedition itineraries. Oceania Cruises and Regent Seven Seas Cruises to Eliminate 5 Million Plastic Bottles Oceania Cruises and Regent Seven Seas Cruises have both committed to serving their guests prestigious Vero Still and Sparkling water fleetwide, enhancing the experience and eliminating about 5 million plastic bottles. Regent will begin this spring, with the transition from traditional bottled water to premium Vero Still and Sparkling water eliminating approximately 2 million plastic bottles annually across the cruise line’s fleet, while improving the taste of complimentary still and sparkling water that Regent guests enjoy. Oceania Cruises expects to ultimately eliminate an estimated 3 million plastic bottles per year through its partnership with Vero Water: a pioneering green initiative that is the newest facet of the brand’s OceaniaNEXT enhancements and the company’s larger Sail & Sustain environmental program. As part of its OceaniaNEXT initiative, the line’s ships will be outfitted with Vero Water’s acclaimed still and sparkling water distillation systems starting in April. Princess Cruises Introduces The Reef Family Splash Zone Onboard Caribbean Princess When Caribbean Princess emerges from drydock in June, for a season of summer cruises to the sun-drenched Caribbean, The Reef Family Splash Zone will debut offering a refined, playful and relaxing area for adults and kids alike to gather and enjoy the sun and water together. MedallionClass vacations, offering guests a portfolio of experiences specifically designed to enhance their cruise vacation. Considered a breakthrough in the vacation industry the OceanMedallion wearable device features leading-edge technology that delivers personalized service through enhanced guest-crew interactions, eliminates friction points and enables interactive entertainment. For families looking for immersive, enriching and fun experiences while traveling, Princess Cruises partnered with Discovery Inc. to create “Discovery at SEA” onboard programming that bring to life many of the destinations visited while on a cruise and favorite Discovery and Animal Planet shows. With family travelers in mind, Caribbean Princess offers 87 connecting staterooms keeping the whole family together. Each stateroom features the cruise line’s award-winning Princess Luxury Bed, designed in collaboration with sleep exert Dr. Michael Breus for the ultimate night of sleep at sea. languages. Able to answer hundreds of questions about the cruise, she can provide information about onboard services, provide guidance and suggestions or help to book a service. An easy to use device – guests just say, “OK ZOE”, and she’s ready to help. The advanced voice recognition feature makes it easy for everyone to control and access information using only voice commands. ZOE will launch on MSC Bellissima and will then be available on each new ship following. Cunard unveiled its new dining concept, ‘Steakhouse at The Verandah,’ which has become a permanent feature at the alternative dining restaurant on board the line’s three Queens: Queen Mary 2, Queen Victoria and Queen Elizabeth. Taking influence from both sides of the Atlantic, Cunard’s team of chefs have curated a menu showcasFounder of an award-winning restaurant group that spans the world, including his legendary Michelin-starred flagship, DANIEL and Café Boulud, in New York City, Chef Daniel Boulud is a name every foodie knows. Now, he’s joining culinary forces with Celebrity. As Celebrity’s Global Culinary Brand Ambassador, Chef Boulud will design signature dishes for Luminae, the brand’s exclusive restaurant for suite class guests. Celebrity is also introducing Chef’s Table by Daniel Boulud, complete with a private galley tour and five-course dining experience, plus guest chef appearances on board. The brand is also working closely with Chef Boulud on a culinary mentorship program where the most talented up-and-coming chefs can hone their craft by learning from the best – both in Celebrity’s kitchens and in Chef Boulud’s. Holland America Line Turns Up the Heat with Five New America’s Test Kitchen Cooking Shows for 2019 From foodie newbies to seasoned cooks, Holland America Line is encouraging guests to embrace their love of cooking alongside the experts at America’s Test Kitchen with five new shows starting in January 2019.
ing prime USDA gran finished New York strip steak, Main lobster and Alaskan king crab, alongside dishes celebrating British provenance such as Scotch grass-fed, dry aged beef and Salt Marsh lamb rack. Offerings from farther afield such as renowned Waygu beef from Australia are also featured on the menu. The new 45-minute presentations—covering everything from tacos and takeout to dinner for two and sweet treats—join the 14 current shows and feature a mix of video, instruction and live recipe demonstrations. Oceania Cruises Reveals Exclusive Dom Perignon Pairing Dinner Oceania Cruises unveiled its exclusive Dom Perignon Experience at La Reserve. This first of its kind dining experience pairs six palate-piquing courses with a different expression and vintage of Dom Perignon’s acclaimed vintages. Created by the culinary team at La Maison Dom Perignon in conjunction with Oceania Cruises’ culinary team, the dinner is offered to a maximum of 24 guests. “We created this dinner to be sophisticated, memorable, a little bit decadent, but also a lot of fun. After all, champagne is all about celebration,” stated Bob Binder, president and CEO. that soar 40-feet above the water, with triple the glass of other riverboats to offer astounding views. ship building and engineering are seeking cruise-related content so that their undergraduates understand whom they are building for and realize the experiences expected from the features being designed. Other areas such as tour operations and guiding are also requesting cruise-related education more than ever. Japan and Malaysia are others that are gaining interest in using more cruise-related content into their existing vocational offerings. As cruise-specific information and education demand grows, there is one nation that epitomizes this interest, from the diversity of stakeholders engaged to weight of sheer volume of curiosity: India. On the precipice of their own domestic market emergence, the enthusiasm and thirst for networks and knowledge is as strong as I have ever seen from any market. ruise destinations have entered a new frontier over the past decade, with revolutionary new experiences and approaches to maximize guests’ time and fun, and Costa Maya has definitely not missed the train during the ‘westward expansion.’ From a couple cruise calls per season to over 400 calls per year and growing, Costa Maya has positioned itself as a top cruise destination in the Caribbean and around the world. St. Maarten: Remarkable Recovery of the “Destination of Choice” In 2019, Port St. Maarten is celebrating thousands of berths, award-winning facilities and 55 marvelous years. “THE PARTNERSHIP DEVELOPED WITH THE CRUISE INDUSTRY OVER THE PAST 55 YEARS HAS SHOWN THE CONTINUED SUPPORT…” combined passenger and crew onshore visits. Its 933,900 combined visits are more than 40 percent below that of the 2014/2015 study. These visits generated an average total expenditure of $153.38 per visit across all passenger and crew visits, fourth highest of the 36 destinations. St. Maarten also had the fifth-highest spend on wage income among the 36 destinations in this study. PORT ST. MAARTEN OUTREACH LEADS TO OPPORTUNITIES Port St. Maarten Management is pleased with how ‘Fly & Cruise Homeporting’ has taken off for the high 2018-19 cruise season. A number of small cruise lines have used Port St. Maarten as their homeport of choice in the northeastern Caribbean. of Puerto Plata; Mauricio Hamui, CEO of Puerto Plata Post Investment, concessionaire of the port; and other personalities linked to the tourism sector and executives of different cruise lines. With the first stage slated for completion by year’s end, the arrival of more than 650,000 cruise guests is expected in the first year of operation. There will be around 12 cruise lines with 117 vessels in total, including Celebrity Cruises, MSC Cruises, Norwegian Cruise Line, Royal Caribbean International and Virgin Voyages – and coming from Ft. Lauderdale, Miami, New York, Orlando and Tampa Bay, as well as Barbados, Cuba, Curaçao, Montego Bay, Puerto Rico and St. Lucia. The entire project is a public-private partnership model—which will develop Taino Bay with an investment of over $125 million and generate 6,000 direct jobs and approximately 15,000 indirect jobs—and is expected to be ready by summer 2020, and then welcome 1 million passengers during the 2020-21 season. “No one stops Puerto Plata,” said García. “There is no way to stop the development, prosperity and success that awaits. We must continue to support investors, protect investments and receive, as has been done, cruise passengers.” The whole province of Puerto Plata is full of touristic places, including beautiful beaches, golf courses, hotel complexes and resorts located directly on the beaches, along with an international airport. In this beautiful city you can find the only funicular cable car in the Caribbean, along with Ocean World, Cayo Arena, Ensenada Beach, Damajagua Falls, Playa Dorada, zip lining of Yasica, Monkey Jungle, Encuentro Beach, Ocean Village and the Fort of San Felipe. There are few places on the planet that produce amber, and Puerto Plata has the most important mine of this resin in the world, and the Amber Museum. Puerto Plata boasts some of the best beaches in the Dominican Republic, such as Sosua Beach, Dorada Beach, Maimon, Cafemba, Playa Grande (of Luperón), Cabarete, Cofresí, Long Beach, Longbichito. Some—such as Playa Dorada, Cofresí, Long Beach or Cabarete—offer various watersports, such as jet skiing, surfing, windsurfing and sailing. Other beaches can be found along the boardwalk, or in Boca Nueva, Playa de Copello, Bergantin or La Mariposa. The Landings, Bel Jou Hotel, Rendezvous, Iyanola Divers and Dive Adventures. As the SLTA continues to target the dive niche, the Authority is preparing for the Diving Equipment & Marketing Association (DEMA) show in Orlando, Florida from November 13-16, 2019. During DEMA the SLTA plans to present its products to hundreds of exhibitors and thousands of dive and travel industry professionals, as well as a recap of DiveFest 2019. For more information on Saint Lucia’s Dive festival visit www.stlucia.org. CARIBBEAN TOURIST VISITS BEAT PROJECTIONS AND CRUISE SECTOR BREAKS RECORDS IN 2018, OPTIMISTIC OUTLOOK FOR 2019 Caribbean nations recorded 29.9 million tourist visits in 2018, according to the numbers released by CTO in February. This represented a 2.3% decline from the region’s record 30.6 million visitors in 2017, surpassing the 3-4% decline CTO officials originally forecasted in the aftermath of the historic hurricane season in 2017 – helped by a strong rebound in the last four months of 2018, with arrivals up 9.8%. The region was also buoyed by the cruise sector and its best-ever performance in 2018, posting 28.9 million visitors and a 6.7% increase over 2017. Looking to 2019, the Caribbean is poised for a return to strong visitor growth, with CTO predicting arrivals to increase between 6-7%. destination. Individually, yachting numbers increased by 26.7%; cruise by 13.6%; and stay-over arrivals by 2.2%. This represents records for each of the categories. The growth in the tourism sector follows major strides by the Saint Lucia Tourism Authority to reposition Saint Lucia as the destination of choice and to work with partners to ensure visitors enjoy a truly experiential vacation on the island. DOMINICAN REPUBLIC WELCOMES RECORD TOURIST ARRIVALS Another Caribbean destination has reported record numbers for 2018. According to the Central Bank of the Dominican Republic, the destination welcomed a historic 6,568,888 travelers: 381,346 more people and 6.2% higher than 2017. Of this increase, 69.4% (and 264,544 additional passengers) corresponds to foreign tourists, with the rest reflecting Dominicans living abroad. The report praised the Ministry of Tourism’s and private sector’s efforts targeting international markets, and the arrivals of non-resident passengers were in fact spread around the globe: 58.4% from North America, 23.7% from Europe, 13.6% from South America and 4% from the Caribbean and Central America. DOMINICA SHOWS SIGNS OF TOURISM RECOVERY WITH STRONG Q4 PERFORMANCE Dominica welcomed 22,178 arrivals from October – December 2018—95% more than the same period in 2017, 35% of 2018’s total arrivals and a slight increase (0.9%) compared to 2016. This was further buoyed by a record close in December, with 5,271 arrivals—the most ever for the month and 6.7% higher than December 2016. The last two months also gained steam for cruise tourism, and the destination recorded cruise visitor arrivals in July, August, and September for the first time in five years, contributing to a total of 134,469 arrivals in 2018. COLOMBIA CLOSES 2018 WITH RECORD FOREIGN TRAVELERS A record number of foreign travelers visited Colombia in 2018. Year-end numbers show about 1 million international travelers entered the country through airports and cruise terminals, and the destination welcomed 3.5 million visitors: 9% more than 2017. According to Vice Minister of Tourism Juan Pablo Franky, that growth is higher than the increase in world tourism, which stands at 5%, but below the target. “Our goal in the four-year period is to grow at an average rate of 12%,” he continued, and told that more than 4 million passengers are expected to be mobilized from air terminals by 2019’s year end. GUATEMALA’S TOURISM CONTINUES HOT STREAK, 13% RISE EXPECTED FOR 2018 Guatemala welcomed a 13% growth in the number of arrivals for 2018 compared to 2017, according to calculations by INGUAT—representing the arrival of 274,725 additional visitors and setting the number at 2,387,995. “We have seen a double-digit growth for two consecutive years, which is important for the country’s economy,” said INGUAT Director Jorge Mario Chajón. That will build on the momentum from 2017, which brought an 11% increase over 2016, and continue heat up in 2019 with numerous international meetings in 2019 to help promote the country. embark for a greater sampling of Nicaragua’s attractions such as a quick adventure to Granada Colonial City, Masaya Volcano, Ometepe Island or Leon (the country’s historic first capital dating back to the 19th century) and its famous Catedral de la Asunción (a UNESCO World Heritage Site). MIRAFLORES BAY CRUISE TERMINAL SLATED TO TRANSFORM LIMA, PERU IN 2021 Miraflores Bay Cruise Terminal—a national investment project carefully planned with the utmost respect for the city, its inhabitants and the environment—is slated to open in 2021 and transform Lima, Peru into an icon of the South Pacific. come 1 million cruise passengers in the coming years to the Port of Willemstad. JAXPORT CRUISE TERMINAL SERVES RECORD PASSENGERS, WELCOMES ENHANCEMENTS JAXPORT’s Cruise Terminal served a record 199,899 passengers in 2018, marking more than 2.4 million passengers sailing from Jacksonville since 2003. Carnival Cruise Line recently agreed to extend service potentially through 2027, resulting in a number of major terminal enhancements. Beginning in May, the recently upgraded Carnival Ecstasy will assume Carnival Elation’s year-round four- and fiveday cruises out of JAXPORT. PUERTO VALLARTA EXPECTS 47% MORE CRUISE CALLS IN 2019 Puerto Vallarta welcomed 311,445 cruise passengers to its shores on 117 cruise calls in 2018, and 172 calls are expected in 2019—an increase of over more than 47%. The destination started the new year with a triple call on January 2 and a quadruple call on the 30th. PROGRESO GROWS CRUISE CALLS 9% The cruise industry in Progreso grew in 2018. Last year the destination closed with 148 cruise calls—8.8% higher than 2017. The destination also saw a growth in passenger numbers, rising from 413,233 in 2017 to 443,182 in 2018—a 7.3% increase. DOMINICAN REPUBLIC EARNS 100% ON CRUISE PROJECTIONS IN 2018 In 2018, the Dominican Republic welcomed 1,357,969 cruise passengers and crew members, thus 100% fulfilling the projections estimated for the period. Of this total, 1,008,177 were passengers, and 349,792 were crewmembers. USVI FOCUSES ON CRUISE PASSENGER SATISFACTION U.S. Virgin Islands Governor Albert Bryan, Jr. wants to position the Territory as a regional leader in customer service satisfaction. He made the declaration during a meeting of the FCCA Operations Committee aboard MSC Seaside while on St. Thomas in January. Governor Bryan said the USVI would not rest on its laurels despite improved customer satisfaction scores. 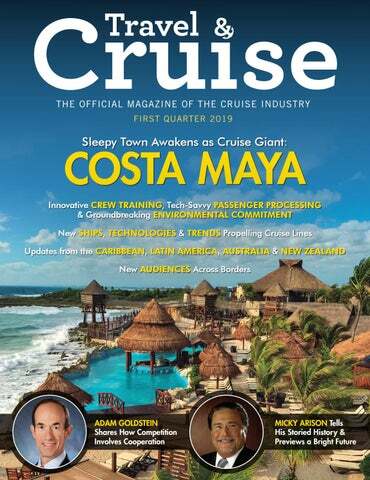 He said boosting service was imperative as the destination seeks to become the top cruise destination in the region. mutual success between the destination, stakeholders and cruise lines, all while maximizing one of the largest influencers of passenger satisfaction ratings. BLUE LAGOON ISLAND RAISES BAR ON CUSTOMER SERVICE WITH AQUILA TRAINING Blue Lagoon Island raised the bar on customer service excellence by becoming the first company in the Bahamas to have its entire team—of more than 300—take the FCCA Frontline and Customer Service Workshop provided by Aquila Center for Cruise Excellence. BLI remains committed to providing guests with an amazing experience. SAINT LUCIA BOOSTS CONNECTIVITY OF FREE WIFI INITIATIVE #Instamoments in Saint Lucia are easier than ever to share with (and cause envy in) friends. An initiative to add free Wi-Fi zones across the island—already responsible for free Wi-Fi in almost 30 public spaces—has boosted its coverage. Plans now call for five free zones, including spots in Constitution Park in Castries, Vieux Fort, Micoud, Canaries and Dennery – with the aim of providing Internet access for residents and ensuring visitors can stay connected while enjoying the island. on the Beach, is a casual beach dining spot featuring a mix of small bites, salads and sandwiches, from Spiny Lobster Salad to crispy mahi mahi fish bites, and a cocktail menu from margaritas made from tamarind puree to the “Mutiny on Beauregard’s Bay,” a mix of local Mutiny vodka, freshly-squeezed lime juice, grapefruit juice and aperol. ST MARTIN’S LE PRESSOIR REOPENS WITH NEW FIXINGS Set in the heart of the culinary hotspot of Grand Case in St Martin and named No. 1 restaurant in the Caribbean by Caribbean Journal in 2016, Le Pressoir has officially reopened. The completely renovated eatery has preserved its Creole charm—and connoisseur-friendly wine list that will change every two weeks—with a bright, airy look and a new prix-fixe menu including a starter, main course and dessert. It has also opened an adjacent cigar and rum bar next door called La Part Des Anges. den villas, with amenities like conference space, a bar, a restaurant, a cultural center and a swimming pool. St Kitts Deputy Prime Minister Shawn Richards said the property could “significantly transform” Whitegate and draw new investment to that part of the country. Members & Travel Agents contributing to build the Puerto Rico that we all yearn for and our visitors will be ambassadors to tell the world that Puerto Rico is ready to do business,” said Omar Marrero, execute director, Convention Center District Authority. SAINT LUCIA AIRPORT REDESIGN SET FOR TAKEOFF Saint Lucia’s landmark redevelopment of its Hewanorra International Airport is readying for takeoff. The estimated $100 million project—including the construction of a new terminal building equipped with state-of-the-art facilities, restaurants, shops and executive lounges, along with converting the existing terminal to accommodate fixed-based operators—entered its final design and approval stages in February. “After years of strategic planning, revision and modification of plans, we are excited to be in the process of executing the blueprint,” said Daren Cenac, acting general manager, SLASPA. A fully operational facility is scheduled for completion by the end of 2020.
cold winter season.” Said Jetlines CEO Javier Suarez. “Dominican Republic is one of the fastest-growing and most-visited tourist destinations in the Caribbean, and the diverse geography, rich culture, and warm hospitality make it an attractive vacation spot for many Canadians.” DRAKE IN OSA, PUNTARENAS TOUCHES DOWN REMODELED AIRPORT The Drake airport in Osa, Puntarenas recently inaugurated its new 250 square meter terminal, a platform to park three type B planes, the extension of the landing strip and improvements of the security strip and the perimeter fence. The new terminal has a capacity for 162 people and offers national and foreign tourists better conditions, security and an overall better experience before discovering the region’s lush, raw nature. ST. KITTS WELCOMES NEW AMERICAN AIRLINES ROUTE St Kitts is continuing to soar with new airlift. After a wave of new flights, including new Wednesday flights from Newark to St Kitts and a new route from Minneapolis to St Kitts on Sun Country, American Airlines added a new route from Dallas-Fort Worth to St Kitts’ Robert L. Bradshaw International Airport. The new service launches this spring, with flights operating every Saturday between May 25 and August 17. “The addition of a nonstop flight from Dallas-Fort Worth by American Airlines marks yet another historic first for St Kitts and Nevis as the destination continues to build out airlift from key source markets,” said Racquel Brown, CEO of the St Kitts Tourism Authority. OECS AND IATA FLYING TOGETHER TO LIFT OFF EASTERN CARIBBEAN’S CONNECTIVITY AND INTRA-REGIONAL TRAVEL The Organization of Eastern Caribbean States Commission (OECS) and International Air Transport Association (IATA) are working together to improve air connectivity in the Eastern Caribbean, with the long-term goal of streamlining intra-regional travel. The groups met in December to address current barriers and how to overcome them, including upgrading border management systems to more user-friendly ones and handling passengers more efficiently. “Our meeting lays the groundwork for creating opportunities to cooperate more closely to support aviation’s ability to deliver even more value to the Eastern Caribbean region,” said Annaleen Lord, IATA’s area manager for the Caribbean.